Ultra mobile PCs that are light on the pocket! There is a lot happening in Europe at the moment, but that’s not the only subject of this post. 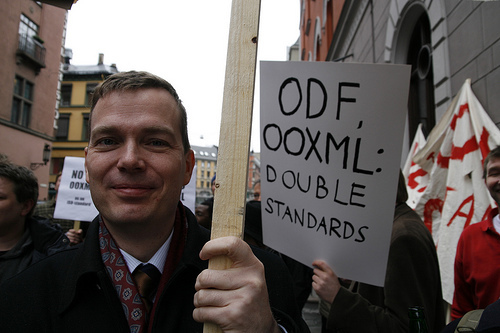 Herein you’ll find a grouping of more good news for real open standards (like ODF) and Free software. The OLPC debacle may have eclipsed the good news, but it’s actually a wonderful time and another major tipping point for GNU/Linux. As far as FOSS and ODF go, some weeks ago we saw big success stories in Germany [1, 2, 3]. This wave is not over yet and here is some of the latest. According to this German article, the City of Munich and the German Federal Foreign Office have started to collaborate on the implementation of their open source and open standards strategies. Germany intends to gain more independence (practical and financial) with Free software and Microsoft does not sit idly. Microsoft’s OOXML misconduct in Germany was last summarised here, however partially. THE EUROPEAN Commission has started investigating Microsoft’s OOXML standard under procurement rules instead of the old competition statute with which they usually bash the software giant. 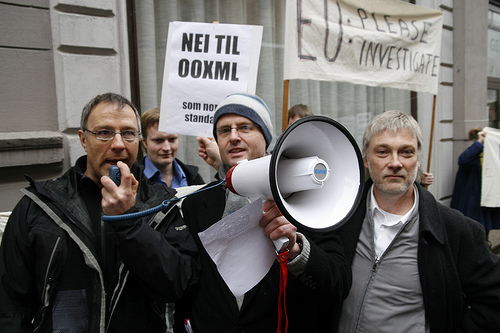 The Danish Unix User Group (DKUUG) complained to the EC’s competition regulators in February about a Danish government mandate on the use of software standards. But the Competition lot didn’t want to know about it. The European Commission confirmed today that its Internal Market people had taken up the complaint. They were examining it to see if it constituted an infringement of procurement rules. This meant that it was designed to give Microsoft documents an advantage, said, Simonsen, in the same way a television manufacturer might have an advantage over its rivals if had designed a signal that was tuned to operate special features on its own sets. The EC’s procurement police are now considering whether this puts the Danish government in breach of procurement rules, despite the moves Microsoft has made to make its standard acceptable. It’s not about choosing, but about having a choice. Yes. Try to understand that fantastic quote from Yasmin Mahmood, Microsoft Malaysia’s (current) Managing Director. This was reported by Tech&U, which is currently leading the pack as the most reliable source of Microsoft propaganda. What’s wonderful is that they quote Yasmin word for word without questioning what she really means. It makes hilarious reading. This type of spin was seen before. Of course it’s a matter of choice. It’s a matter of choosing applications but without unification inside standards there is hardly an ability to choose between applications. Microsoft is, as always, preying on ignorance. Brendan Scott, who has covered some of the OOXML fiasco, wrote a very long essay about it this issue. He explains how governments became agents of monopolisation, anti-Commons. Misapplication of “value for money” requirements when purchasing software results in poor value for money – Government purchasing policies for software tend to support the creation of monopolies. Government purchasing has effects on the price paid by citizens for the product purchased. In some cases purchasing produces volume which permits scale discounts and therefore a net benefit to citizens who also purchase the product. However, in the case of lock in software* Government purchasing can create a monopoly in the software which leads to increased costs for citizen purchasers and a net detriment for society as a whole. It is not appropriate for value for money policies to be assessed on a per acquisition basis when software is being acquired. Doing so will almost certainly create net costs for the community when considered in the aggregate. Government procurement can both create and reinforce a monopoly in goods and services which it is acquiring. Anecdotal evidence suggests that bureaucrats look at “value for money” type formulae and assess it against the cost to Government on a purchase-by-purchase basis. This approach is fine in respect of goods and services which are easily substitutable (such as hammers, screws, cars etc). In respect of goods which are specifically designed to prevent substitutability – eg devices which are not designed to be interoperable it is an extremely hazardous approach. If those goods also tend to be a natural monopoly (such as software in general, but particularly that which is designed not to be interoperable) this approach is absolutely the wrong one. Following the great news from Brazil (reported only yesterday) we have a lot more positive news to share today. On several occasions in the past we wrote about Microsoft hiding evidence of its real financial health. Well, this old paper-and-ink routine seems to have run out of stamina because Microsoft reported a significant drop in profits and its stock tanked. Here it is from Microsoft’s ‘back yard’ press, whose bias — if any — typically works in Microsoft’s favour. Microsoft said today its fiscal third-quarter profit fell 11 percent compared with a year ago, when revenue from pre-sales of the new Windows Vista operating system pushed up results. Earnings were also depressed by 15 cents per share due to a legal fine from the European Commission. Microsoft shares fell $1.25 in after-hours trading, after adding 35 cents to $31.80 during the regular session. Besides the operating system the package is to comprise some freely distributed programs, close to MS Office by their functionality, which are to be used on computers with the following characteristics: 233 MHz and 128MB DDR. Russian Post and American company Red Hat signed the Protocol of intentions on IT development based on open freeware earlier this month. Andrey Pogodin, Deputy Director General of FSUE Russian Post and Jim Whitehurst, President of Red Hat signed the document within the framework of meeting. The parties agreed to join efforts to implement operating system Linux and other software products with open code in Russian Post’s IT-structure. The machines, it was announced, will come with Red Hat’s Linux distro, and will come pre-loaded with software from IBM, including its Lotus Symphony suite. Mr Pogodin, Deputy General Director of Post of Russia, said: “Post of Russia, which has 42,000 post offices through out the country, can significantly lower the cost of ownership of the Information System.” Post of Russia is one of the first customers that signed up to evaluate themove from Microsoft based desktops to OpenReferent solution. Open Referent is based on the recently announced IBM Lotus Open Collaboration Client Solution with Red Hat. Business partners classified as Red Hat Advanced Business Partners and Lotus-authorized IBM Business Partners may sell the Red Hat and IBM Lotus products globally with a Red Hat Enterprise Linux subscription, and may additionally offer a six-month Red Hat Enterprise Linux Desktop trial. Recent interest towards FOSS from the Russian government has boosted commercial activity in this field. No longer than a year ago there was no single large company that would say it is capable of doing FOSS system integration projects. Now there are three, and the number will probably grow. Nobody is particularly sure about how to do business with FOSS, but it is already evident that it can be done somehow. That is why the larger ones are jumping on the bandwagon simply not to be late. Analysts note that Linux vendors are traditionally present on the mobile device market. According to forecasts the OS might become the leader in the segment accounting for 40% of it by 2010. “Currently the share of mobile devices with Linux OS is not big in Russia as compared to other countries, such as China, for instance. However, the producer’s policy, Nokia in particular testifies to the fact the situation is changing for the better”, Ms. Karaeva concluded. Mandriva has been selected as ‘Product of the Year 2007′ in the Linux category at the Softool exhibition in Moscow. The ‘Product of the Year 2007′ competition was held by the department of information technologies and computing systems of the Russian Academy of Sciences, the Federal Agency of Information Technologies, the publishing house SK Press, and IT-expo. Mandriva development is carried out jointly by Mandriva’s offices in Russia, France and Brazil. The Mandriva Linux OS is thus considered a national OS for Russia. The decision of FSTEC of the Russian Federation (RF) implied that Russian public agencies will be authorised to use the Mandriva Linux OS on PCs running confidential information. Russia decided to follow after EU countries, where opensource solutions are more spread then in Russia. Currently, some Russian companies can offer their own Desktop Linux OS (the major companies are ASPLinux, ALTLinux, Linux-Online and LinuxCenter). Microsoft says that the incident has nothing to do with them, but it appears that Russian schools in the area are so scared about being shipped off to a Siberian Gulag, that they are buying Linux gear instead. According to Karpushin, schools would start using freely distributed software like the Linux OS, Russky office and Open office desktop apps, Ekho Moskvi reports. The reason that the Russian announcement is funny boils down to the perception over the years that Russia equates to totalitarianism, whilst here in America we’re all about Freedom and innovation. Yet our educational system — the very underpinnings of how we’re growing out future technological talent, is based upon the inversion of what one would expect given the respective reputations of both countries. Russian OS is to be installed on every school computer in Russia by 2009. Furthermore, every pupil will get the opportunity to operate the applied software produced in Russia, Leonid Reiman, acting Minister of Communication stated at a press conference. According to Mr. Reiman, that might significantly reduce Russian dependence on foreign software. Linux Ubuntu installation on PCs sold by Excimer and NT Computer is to be launched within the nearest month. Consequently, Ubuntu sales in Russia might reach 300 thousand units. Ubuntu 8.04 released on April 24, 2008 is more likely to be preinstalled. The Leningrad Regional administration and the Microsoft Company have signed an agreement ‘of intent in IT implementation’. Thus, the Leningrad Region confirms its commitment to set up e-government following the suit of St. Petersburg, where a similar Bill Gates Corporation’s project has been used for more than half a year. Novell happily considers itself and even describes itself as a Microsoft partner, which possibly makes it part of that self-serving channel or the Microsoft ecosystem. Just watch the recent story from China for enlightening examples [1, 2, 3, 4]. It’s interesting to have it confirmed that SuSE could have had a better destiny. It was purchased with IBM’s encouragement but by the wrong company. It could have been bought by Red Hat. 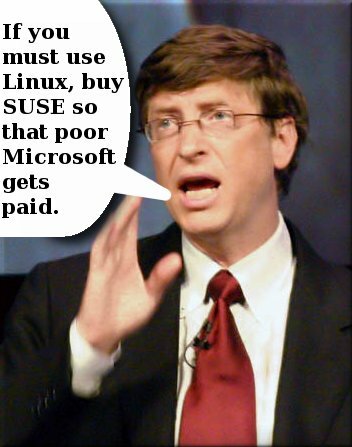 First in line to acquire SUSE back in the day was…Red Hat. Matthew Szulik decided to pass on the opportunity and, well, the rest is history. Ironic, isn’t it? With whom would Microsoft have done its patent deal had Novell not been around? Would Ubuntu have started sooner to fill the competitive Linux void? By the end of this year 29,000 labs serving some 32,000,000 students will be fully deployed and in active use. By the end of next year (2009) those numbers will have swelled to 53,000 labs serving some 52,000,000 students.